Today I'm giving a peek of my sprigified kitchen. The easiest way to change things up for the season is to add a pop of color and fresh flowers. This time I tried to add a few more robin's egg blue things. I'm just swooning over this color and when you can find things inexpensively it's fun to incorporate something new. We found these pretty plates on my girlfriends weekend a couple of weeks ago. They were such a great price they couldn't be passed up. I've never regretted buying dishes. Over in the corner of the kitchen, the tray always stays there and the plates get switched pretty often. I like my kitchen pretty clutter free. We really do cook in our household so clean and clear counters are for us. The sweet Hello Spring printable was a free download from Lollyjane.com. Free printables that people provide on their blogs really are the best thing since sliced bread. A couple of my blogging buddies are also sharing their spring kitchens today. Pop over to White Spray Paint and At Home With Jemma for more. It looks great Stacey. Thanks for the great idea of putting a plant in my MC kettle! Have a great week! How pretty every detail is and I love, love that shade of blue! I love this over from Mosaic Monday and I definitely need a lamp in one corner of my kitchen counters. Never know what you will find from great bloggers. Thanks for sharing. I like your kitchen even better with your new blue touches! Perfect. You are the essence of spring Stacey. Whether you are answering my frantic questions about computer/blogging or we are laughing about my questions about blogging :), you do it with a generous spirit. Your kitchen looks lovely and I love your touches of robin's egg blue. PS. I can always think of more questions! I agree about the free printables...great stuff! Your kitchen looks lovely and I adore the robin's egg blue color you've added! I adore those blue dishes and that teapot is beautiful. What an amazing tour, my lovely Stacey, I truly enjoyed it ! Love your pretty blue dishes and that darling teapot! Love all your spring touches. The robins egg blue is just perfect. 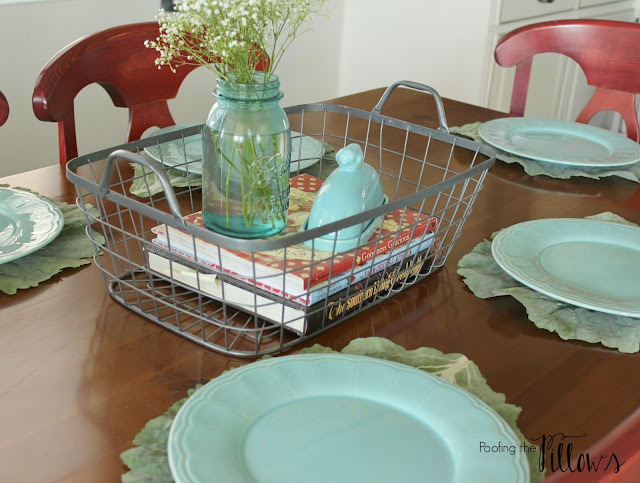 I am totally infatuated with that shade of robins egg blue, and no, I have NEVER regretted buying dishes ;) Your kitchen looks fresh and beautiful for Spring. I have never visited Lollyjane, so off I go to see what it's all about. Have a great week Stacey! Your kitchen looks lovely, Stacey, and very springified! Please send some Spring our way - we've had snow every day for a week! I have a weakness for plates too! So pretty!! I love the new dishes and the pops of that beautiful shade of blue! Everything looks perfect! Your kitchen looks so pretty! I think the robin's egg blue adds so much & is perfect for Spring! Springy and pretty too. Love that black and white tea pot too! Love all the touches of mint all around! So pretty! I love all the touches of red and aqua--perfect combo! I love your spring colors. I think one can never have too many dishes. They are a great way to decorate as well. Your Springy kitchen looks so neat and tidy, Stacey. I love your CC teakettle all filled with dried baby's breath, and love,love your tray in the corner. Yes, some things just need to stay put to feel like home. Your touches of Aqua add the right pop of color. Thanks for the tour. Glad to be a short part of this post & have amazing tour of Kitchen Tour. Your Kitchen is such a beautiful & you have mention it too awesome & I must say. Any one can fall in love with your Kitchen. So pretty Stacey, love the soft aquas and rosey orange colors! Stacey it looks so pretty. Love the blue. Happy New Week. Love it! It just says cozy home to me. Love those red chairs! Just wanted you to know that I tried to comment at the bottom of your emailed post I subscribe to, but you are a no-reply blogger. Hi Stacey, stopping in to say hi. 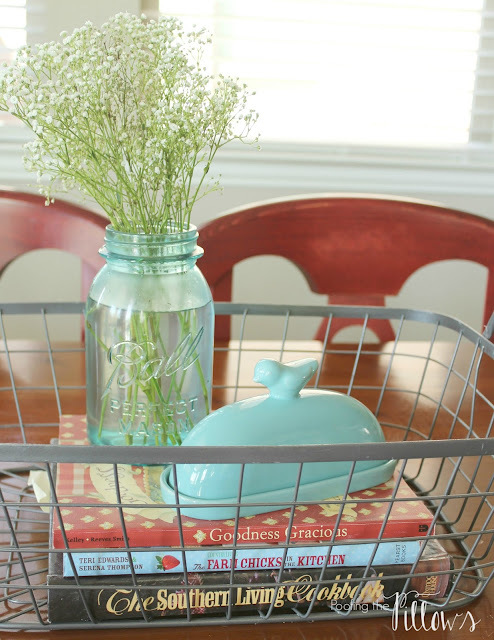 Love your springy kitchen with the pop of aqua. So pretty and I love your corner with the lamp and plate. I am the same way when I find a look that works. Trying to change it up just feels off. I've added the aqua again this year too and really enjoying it. Your MC teapot looks pretty with the baby's breath inside!! Your table centerpiece is charming and I love your butter dish. 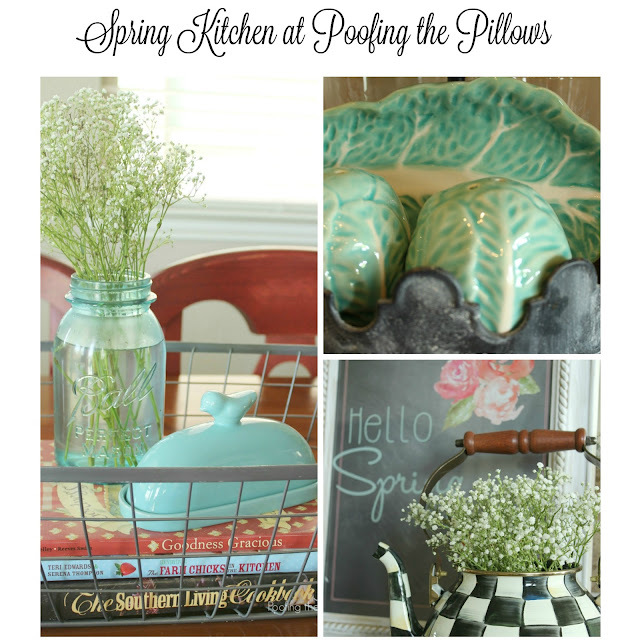 I love your spring time additions to your pretty kitchen. Like you, I am pretty mad about robin's egg blue. Can't seem to get enough of it. It seems to look good everywhere I put it in my home. It looks great in yours too. You've added some lovely touches and color to springify your kitchen Stacey! I love those dishes! Everything looks so pretty! 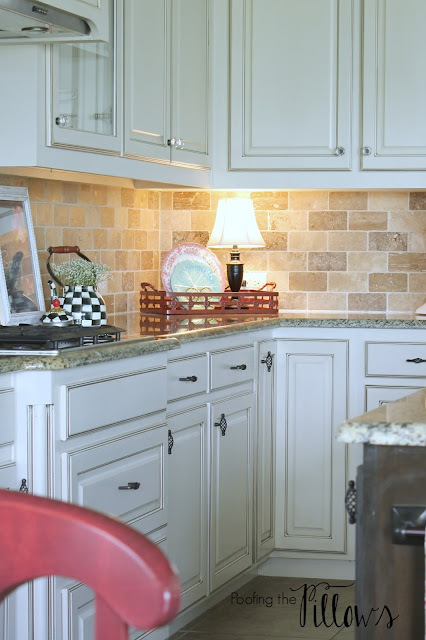 Your kitchen looks like such a bright and happy place to work with all your pretty spring touches, Stacey! My name is Jeanie. I am a china addict. Really -- I can't resist cute new plates or my wonderful family china, vintage Fiesta or vintage Hall, Christmas and Thanksgiving dishes, too. So, of COURSE I love your pretty table and wonderful dishes! What a happy spot! Seeing your kitchen today just made me happy, for it is a cheery spot to nuture and feed your family with color touches and whimsy. I love your Robin's egg blue in your kitchen, but then I've always loved all that you do. It is a fresh spring look. I recently added a lamp to my kitchen corner too and find myself turning it on in the evening whether I need it or not. Love the soft glow it gives the kitchen. I love the plate. So cute. I am in love with the Mason Jar and the printable is so cute. Great minds think alike. I have a plant in my MacKenzie Childs tea kettle right now too! love that robin's egg blue! 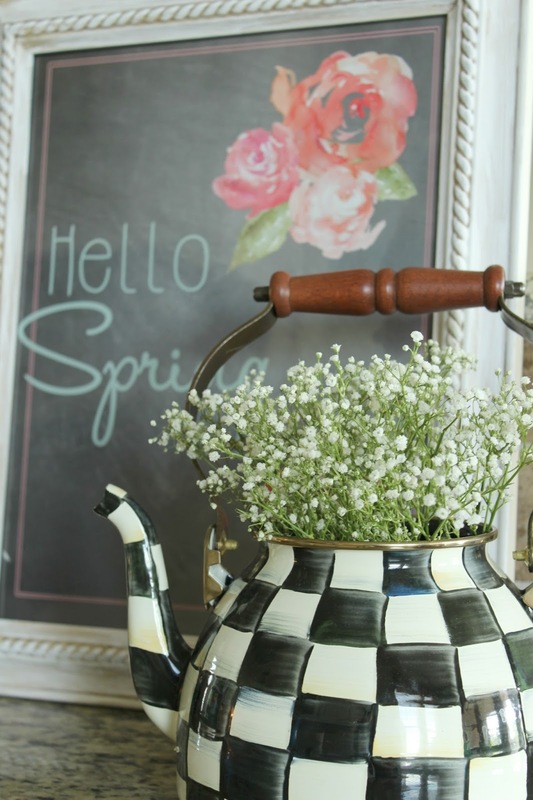 What a sweet springy kitchen - love that black and white teapot with the baby's breath!! Your Spring Kitchen is so pretty, Stacey! I'm so in love with that pretty blue....you call it Robin's Egg and I call it Turquoise! I have the same cute butter dish and several other pieces from World Market in "our" favorite color! I adore the Spring printable....those Lollyjane girls live in my neck of the woods! Your kitchen is so charming and I love the red with the robin's egg blue! What a delightful combination! Love that color too Stacey! The dishes are so pretty and the butter dish is just darling! Never thought of putting a lamp on my counters, but I love how it looks. Beautiful spring touches - love the color! Hi Stacey...we share a love for great dinnerware and clean counters! And I'm actually on my way to a girl's weekend right now, so hope I come back with some great dishes too. Thanks for the inspiration. Everything looks so pretty and springy! Spring always makes me excited, like a kid before Christmas. We are (hopefully) going to get our porch up and running this weekend. It's supposed to warm up here in the next few days. Definitely says spring. Thanks for sharing and inspiring.